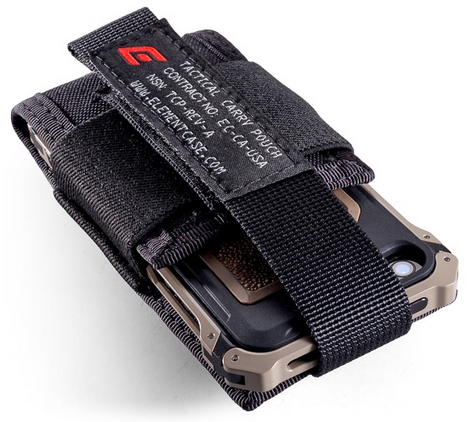 I like the rugged iphone cases that are built to take a beating, however I am not a big fan of all the bulk it takes to surround and protect, basically making a high tech device look like a child's toy. Element Case has not only shrunk the mold on rugged case, but also teamed up with some pretty big brands to expand their lineup. The case in which I received is in partnership with Hogue, a company known by military and law enforcement for their pistol grips. The Sector 5 Black Ops case comes packing a non-glare anodized aluminum case with hard corner links, an Attack Back Plate that includes the Hogue grip insert, and the Element Case Tactical Holster, so let’s see how it holds up. First off, I love the look of the case and as someone that is a gun owner and enthusiast, it is just fitting that these two companies team up for a tactical case. The case in which I received was the Dark Earth color which still has not been scratched after two weeks of hard use. The included rash guards are nice and wrap around the phone so it is not scratched by the case and spare parts are included should you lose a screw or crack a corner. The look of the back plate was awesome as it had the machined G10 grip insert in which Hogue is known for and it also carries a low profile design to minimize bulk. The Tactical Holster is another subtle touch in which I really enjoyed as it fit on my belt or on my laptop bag and actually sported a tactical look. Unfortunately, the main reason I wanted to check out this case is also the only issue I had with it as well. The Attack Back Plate is not locked into place by way of the aluminum bumper, it is a back piece that sticks to the phone and in my situation would stay on for an hour before beginning to peel up. 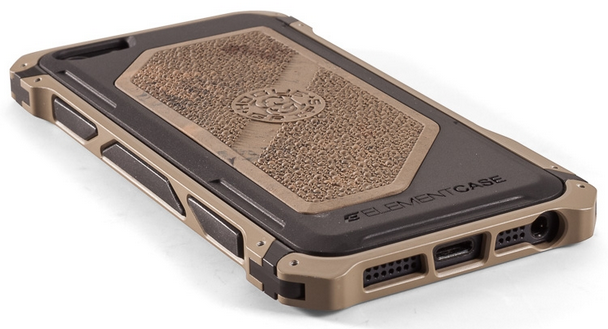 Now, the actual Element Case is awesome with a minimal profile, easy grip design, protection, and massive curb appeal by limitless customization starting at $99.99. Even though I had an issue with the back piece, there are still two other Hogue branded cases, ION 5 Black Ops and Rogue Black Ops, both in which appear to not have a back plate that sticks to the back of the phone.